Here’s the thing. There is a veritable MOUNTAIN of evidence. I have been poring over texts, and readers have been sending in citations, and it just keeps going and going. One of the most prolific sources of citations is none other than Cardinal Walter Kasper. Folks, this business of essentially dissolving the Petrine Office has been Kasper’s life’s work. He has been writing about this basically NON-STOP for darn near fifty years. 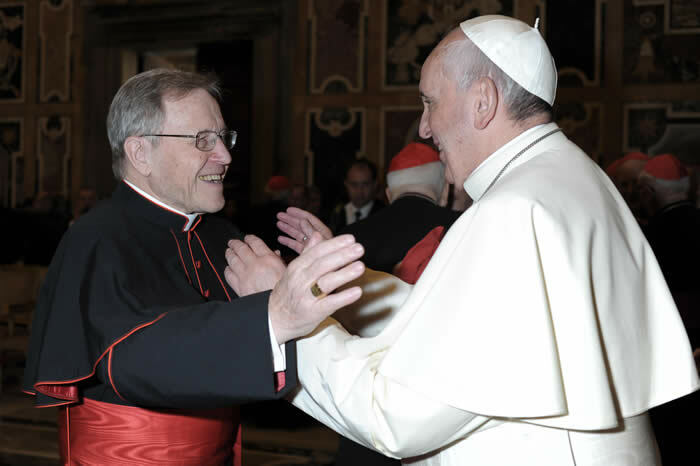 Looking at the timeline, it has become clear that Cardinal Walter Kasper is at the absolute epicenter of the whole conspiracy to “depose” Pope Benedict (his life-long enemy) and install the puppet Bergoglio. Walter Kasper is the head of the group called the “Sankt Gallen Mafia” and has been since the death of Cardinal Carlo Martini. Martini died on 31 August, ARSH 2012. Note that date. Martini, like Kasper, was a massive proponent of essentially dissolving the Petrine Office and decentralizing the Church into a loose confederation or “synod” of “bishops conferences”. Pope Benedict XVI said that he started contemplating his partial attempted abdication “several months” before he announced it. That would put it right after Martini’s death and Kasper’s ascension to the top of the Sankt Gallen Mafia. The faux-conclave convened in March of ARSH 2013 and Walter Kasper’s lapdog, Bergoglio, was named Antipope. Antipope Bergoglio immediately referred to Kasper as his “favorite theologian” and began implementing Kasper’s evil agenda point for point. Kasper wanted Bergoglio as his puppet front precisely because Bergoglio is an idiot who was and is dependent on Kasper and others to provide him with his talking points. Bergoglio was dismissed after only six months from doing a Ph.D. in Germany in the 1970s because he wasn’t intelligent enough to do the work, and has ever since then been trying to ingratiate himself to and prove himself the equal of the German intellectuals. It’s really quite sad. I strongly suspect that it was Walter Kasper, who had hated and been the enemy of Joseph Ratzinger since the 1960s, that pressured, coerced, threatened, blackmailed, whatever it was, Pope Benedict XVI to leave in the autumn of ARSH 2012. Let’s look at some citations. First, let’s look at a chilling citation from Cardinal Joseph Ratzinger’s 1996 book “Salt of the Earth”. The book is written in a question-and-answer interview format with Peter Seewald. Here is page 257. I will transcribe the text so that it populates online in search engines. Emphases mine. SEEWALD: DO YOU THINK THE PAPACY WILL REMAIN AS IT IS? RATZINGER: In its core it will remain. In other words, a man is needed to be the successor of Peter and to bear a personal final authority that is supported collegially. Part of Christianity is a personalistic principle; it doesn’t get vaporized into anonymities but presents itself in the person of the priest, of the bishop, and the unity of the universal Church once again has a personal expression. This will remain, the magisterial responsibility for the unity of the Church, her faith, and her morals that was defined by Vatican I and II. Forms of exercise can change, they will certainly change, when hitherto separated communities enter into unity with the Pope. By the way, the present Pope’s [John Paul II] exercise of the pontificate – with the trips around the world – is completely different from that of Pius XII. What concrete variations emerge I neither can nor want to imagine. We can’t foresee now exactly how that will look. He neither could nor wanted to imagine…. Well, that’s not ominous or anything. Now let’s turn to Walter Kasper. Let’s start with a paper written in ARSH 2002 by Kilian McDonnell, a Benedictine monk. The title of the 19 page paper is, “WALTER KASPER ON THE THEOLOGY AND THE PRAXIS OF THE BISHOP’S OFFICE” with the introduction stating, “The author reviews the discussion between Kasper and Ratzinger on the ontological priority of the universal Church, and then summarizes several studies by Kasper on the papacy and episcopacy at Vatican I….” Yeah, nothing of any relevance or interest here, right folks? Kasper does not enter into the long discussion, preconciliar, conciliar, and postconciliar on the importance of involving bishops in the governance of the universal Church. But the discussion is both an inner-Catholic question and an ecumenical imperative. In his encyclical Ut unum sint (no. 96), John Paul II issued a call for practical suggestions on how the Petrine ministry might be exercised. “Such a dialogue,” Kasper suggests, “would make sense only if it led to a new historical formation of the office of Peter. A new form would be similar to that which the office of Peter had in the first thousand years, but in a form appropriate to the differences in historical periods and the relationships of the various churches.”51 This appears to point to an exercise of the Petrine function which is more participatory in style, involving the bishops of the world. 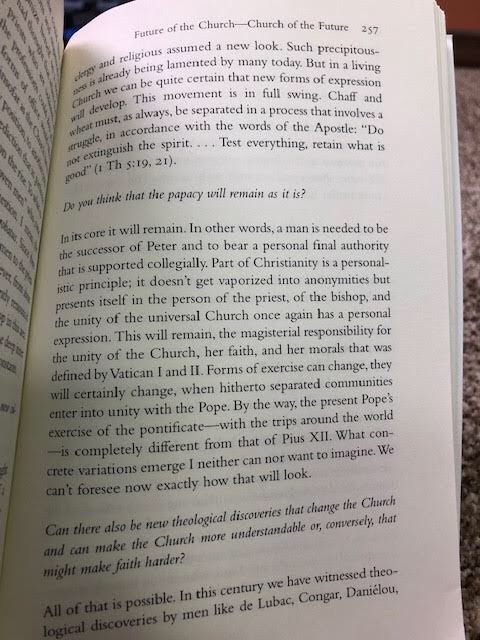 Kasper could call on a number of historical studies to support the con- tention that the Petrine office has historically experienced a number of epochal transformations, and none of its historical forms is identical with the office, including the one that obtains today. “One must indeed say that in the present form of its exercise, the Petrine ministry has far from completely exhausted its ecumenical possibilities.”52 In any new form the essential nature of the Petrine office would have to remain unchanged. But the call for a new form needs to be understood in reference to Kasper’s reading of the development of Catholic ecclesiology, read through the eyes of Vatican I and II. He is obviously convinced that the Catholic sense of the Church demands a strong, even vigorous, papacy. Any new form issuing from Pope John Paul II’s call for help in rethinking the Petrine ministry would not mean a diminished Petrine role, but, on the contrary, as he said in a different context, “an even bigger role.”53 The new expression of the Petrine office would include a significant role for the whole episcopacy in the governance of the Church. 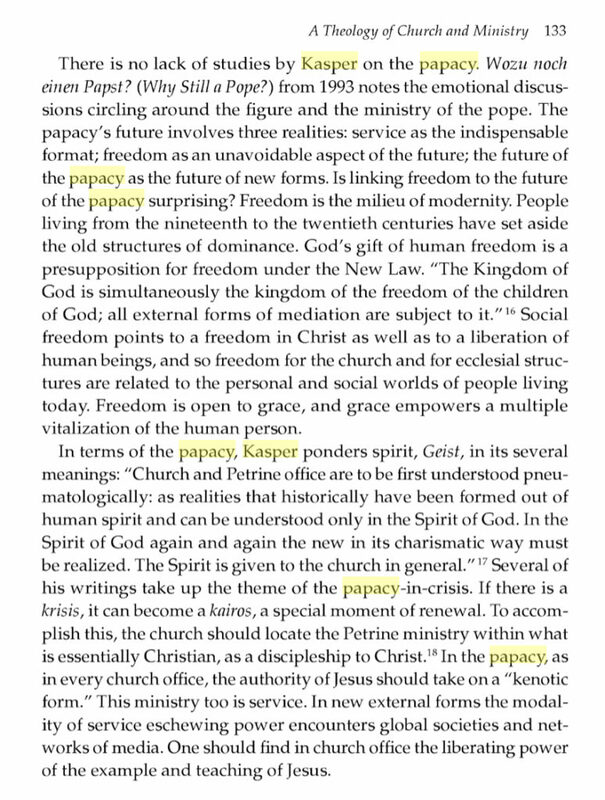 This business of demythologizing, decentralizing and essentially trying to turn the Papacy into a Synod of Bishops has been Kasper’s life’s work. His Sankt Gallen Mafia predecessor, Cardinal Martini, wanted EXACTLY the same thing. Kasper is referred to as a “center-conservative” only because in comparison to monsters like Hans Kung and Johannes Neumann who advocated the TOTAL ABOLITION of the Papacy, Kasper was “conservative” by comparison, and Ratzinger was an arch-conservative… by comparison. But Kasper doubts the necessity, in view of the cultural pluralism in the world, to have pastoral questions determined in all of their details in a binding way by the universal Church, so that factually no room to maneuver remains to the individual bishop as he seeks a pastoral solution appropriate to the specific conditions of his diocese, conditions he alone knows in their particularities. This question comes to mind in view of the document of the CDF “On the Reception of Communion for the Faithful Who Have Divorced and Remarried” (1994),73 as also in the case of the many small determinations of the “Instruction on Some Questions Concerning the Cooperation of Laity in the Ministry of the Priest” (1997),74 even though one agrees with the basic concerns of this instruction. In concluding, Kasper reflects on the meaning for the pastoral practice of a bishop in a world experiencing two opposing movements. On the one hand, the ecumenical and technological globalization efforts are pushing the world toward the global village. But there is a contrary movement in which all things are being westernized, issuing in a new form of the tradi- tional identities of a plethora of cultures, resulting in a conflict of cultures. The forces impelling toward the unity of the global village are being resisted by the clash of cultures. A peaceful future is only possible when the unity of the multiplicity of cultures is achieved. Such a unity in multiplicity is also of great importance for the Church. When the faith and the essence of the Church is inculturated into the multiplicity of cultures then evangelization is possible. In carrying out the mandate to evangelize in the present situation of unity in the multiplicity of cultures the Church will grapple anew with its own unity in multiplicity. Now you know why Antipope Bergoglio demands the destruction of Europe and more specifically EUROPEAN CHRISTIAN CULTURE by trafficking in musloid conquerors. Because this has been his master Walter Kasper’s agenda for decades. Now let us turn to the book “The Theology of Walter Kasper: Speaking Truth in Love” published in ARSH 2014. What I need is for our German readers to attack “Wozu noch einen Papst?” I mean, the guy wrote an entire book called, “Why is there still a Pope?” Do you think MAYBE there is something of interest and relevance in such a book? And hey, no one else is going to do this, so either we do it, or it doesn’t get done. Kenosis is a Lutheran theology (shocker!) that uses Christ’s self-emptying (Philippians 2:7) to essentially deny the Social Kingship of Christ, and to demythologize at best and outright deny at worst, the Petrine Office. A King without a Kingdom, a Papacy with no authority. Yep. Walter Kasper, who is a proven liar (remember the Edward Pentin scandal when Kasper denied saying that the African bishops need not be paid any attention, except Pentin had recorded the whole thing on his phone and posted the audio file? Pentin’s career would have been FINISHED had he not been able to rebut Kasper’s filthy lying mouth with the recorded audio. Kasper was perfectly happy not just to lie through his teeth, but to destroy a man’s career, reputation and livelihood in the process) is at the very epicenter of the faux-abdication and subsequent usurpation by Antipope Bergoglio. This whole thing is a Walter Kasper production. Don’tcha think maybe someone should be asking some questions? Blessed Emperor Karl and Servant of God Zita, pray for us! St. Vincent Ferrer, pray for us! This entry was posted in Uncategorized on January 22, ARSH 2019 by Ann Barnhardt.